Have you ever wondered how the world looks from the point of view of a hammerhead shark, with its hyper-stereo vision? How about a horse, which has exceptional peripheral vision? Or a chameleon, which can look backwards and forwards at the same time? Now, thanks to artists Anne Cleary and Denis Connolly, you can find out. 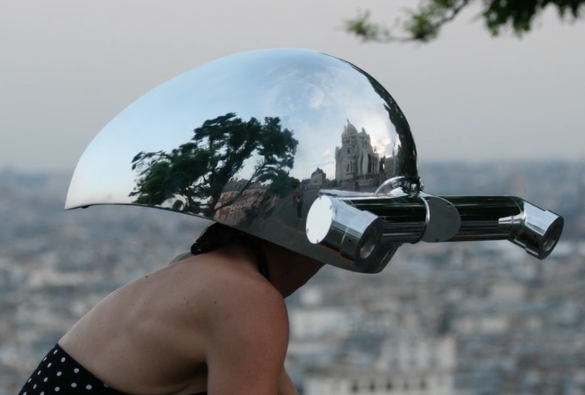 Cleary Connolly have developed a series of wearable sculptures called ‘Meta-Perceptual Helmets’ – helmets that enable you to see what an animal sees. Drop into Rothe House every day during the Festival, where you can try on a range of helmets – for creatures both real and imaginary – and wander around the gardens, transforming yourself into a living, moving sculpture to see and be seen. At once playful and serious, Meta-Perceptual Helmets is an innovative and interactive exhibition that meets art’s greatest challenge – to make us see the world afresh.